We are happy to introduce you to Chicago bookbinder and installation artist, Karen Hanmer. Hanmer is a master at integrating contemporary subjects and old world craftmanship, creating work that is perfection. Nothing demonstrates this more clearly than All Shook Up. Hanmer has taken the iconic Elvis Presley, and showcased him in yet another new venue. Thanks to her use of an accordion flag book technique, Elvis seems to come alive. In Mirage, Hanmer creates an ephemeral scene, dreamlike and misty. A rushing of monochromatic color gives the viewer a feeling of speeding down the road in a convertible, hair whipping in the wind, gathering glimpses of scenery. The use of beautifully textured paper will help you experience the scene rather than remain an onlooker. Hanmer has exhibited all over North America and England. Her work is included in as many collections, including Graceland. Hanmer has been a friend of 23 Sandy for years and we encourage you to come by and take a look at her eclectic work. View a catalog of Hanmer’s work that we carry in the gallery here or stop by and see it the gallery sometime soon. Please join us on Black Friday, November 27 for a little bit of post-Thanksgiving fun at 23 Sandy Gallery. All day on Friday we are offering 20% off anything black and white in the gallery. Photography, paintings, broadsides, or books—current show or back room goodies. If the art is black and white, it is 20% off. And, just in case you are still hungry, Linda will be serving tea and cookies all day. Stop by while you are out and about. In the United States, artist books are considered ‘miniature’ when they are no more than three inches in all dimensions. In other countries, they might be up to four inches. Coveted by collectors for their charm, artistry, and affordability, this special genre of the artist book world is well worth seeing. We are showcasing these tiny treasures in the Gallery right now. You will be delighted by these pieces and perhaps even be inspired to try your hand at creating your own. In the meantime, enjoy this miniature glimpse into our inventory. Portland artist, Linda Welch, works in a variety of media. Her Concealed Within series is a collection artist books with a focus on visual texture, color and composition. 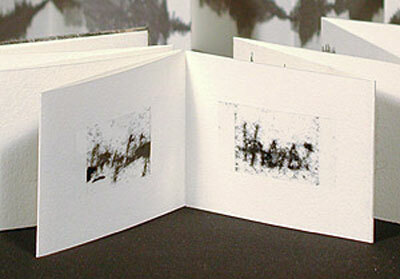 Her books are visually tactile and meant to be experienced. Alicia Bailey is a studio artist from Denver, Colorado, who is currently focusing on book forms as interactive sculpture. Although Bailey often works with unexpected elements, January incorporates traditional materials and structures. Washington artist, Jill Timm, made her first book in the fifth grade. Having maintained her fascination with the book arts, Timm offers several fine examples of her work. A flip through Flower Delight will thankfully take you back to summer. Wildflowers form A-Z are beautifully illustrated in Spring Wildflower, from Peter and Donna Thomas. 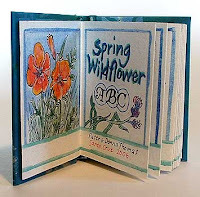 Truely a handcrafted book, Donna’s watercolor botanicals and Peter’s handmade paper, make this accordion book a beauty. The Thomas’ reside in Santa Cruz, California and their work brings their love of nature to life. Laura Davidson’s, Espresso Pot 6 Ways, is sure to jumpstart your interest in miniature artist books. The influences of travel, art history, and architecture frequently show up in her work. Davidson lives in Boston, Massachusetts and along with books, makes mosiacs and boxes. Be sure to visit us and explore this fascinating world of miniature artist books.You can always find a catalog of our book arts inventory on our Artists in Inventory web page. In her Through a Glass Darkly series of work, Portland photographer and gallery favorite, Smith Eliot explores feminine forms and themes in her dreamy, ethereal images. Using a process that layers her photographs with an encaustic-like acrylic surface, Eliot’s subjects appear to be just beyond the veil, not quite able to “break out of their environs, encased in an obscured, soft fog that is difficult for us to penetrate and difficult for the subjects to traverse.” Eliot considers her work to be a metaphor for a subconscious state of knowing. Eliot is an award winning photographer who lives in Portland, Oregon and shows her work internationally. She has been published in Shots Magazine and B&W Magazine, among other photographic and literary journals. Stop by the gallery soon to see a selection of Smith’s work. You can also view her online catalog here. Down and Out is the theme for this year’s New Directions, the annual juried photography show sponsored by Wall Space Gallery in Seattle, which seeks to discover new talent in the world of photography. 23 Sandy Gallery in Portland will host this exhibition, the fourth annual New Directions in February following its Seattle premier. This year’s juror is Carol McCusker, PhD, Curator of Photography at the Museum of Photographic Arts (MoPA) in San Diego. Andrea Benson is a Portland-based encaustic painter whose work is appealing for its lovely, narrative quality. In encaustic painting, collaged artwork is sometimes embedded into the painting, employing molten wax and resin based paint. Dimension is created by carving and layering the wax and pigment, and fusing these layers to wood with a propane torch. This layering technique gives encaustic paintings their luminous depth and beauty. We have offered Benson’s work at the Gallery since July and are excited to have some new pieces to show. Her unique and beautiful paintings have been featured in the book Embracing Encaustic and in Oregon Home magazine. Benson teaches classes in encaustic technique in her Portland art studio and will be featured in a solo show here at 23 Sandy in May 2010. Be sure to come by the gallery and take a look at these fascinating pieces. Click here to see a catalog of Benson’s work. In light of the mixed results in last week’s elections we are proud to call your attention to this miniature artist book by Peter & Donna Thomas. No Form of Love may be small in size, but it’s message is large and perfect for these times. “No Form of Love Shall be Despised” is a quote taken from one of Eleanor Roosevelt’s personal notebooks. It speaks as succinctly now as it ever did. No Form of Love is a beautifully handcrafted scroll style book. The Thomas’ have combined handmade paper, linoleum carved images, and paduk wood to create an intricate, yet totally discernible artist book. Peter and Donna Thomas reside in Santa Cruz, CA and have been making books and paper, and letterpress printing, since 1976. We have several of the Thomas’ books at 23 Sandy Gallery and would be excited to have you see their beautiful work. Be sure to ask at your next visit. Gallery hours are Thursday-Saturday, Noon-6:00 p.m. See a few of the Thomas’ other books here. We’re Back! First Thursday & First Friday! Our newest exhibit features Portland artist, Heidi Kirkpatrick and Tacoma artist, Victoria Bjorklund. Fine art photographer, Heidi Kirkpatrick is showing Gray Area. Kirkpatrick often using subjects with whom she has a personal relationship, exposing how society’s expectations restrain and confine contemporary women. Kirkpatrick transforms found pbjects into playful pieces of art. Fusing transparent figurative photographs, Gray’s Anatomy illustrations and children’s toys, blocks, boxes and tins, she creates playful tension between imagery and object. Kirkpatrick’s work is included in OSHU’s Corporate Collection as well as several museum collections throughout the United States. She has been featured in two previous group shows at 23 Sandy Gallery. Click here to preview her show. In Glass Figments, photographic and book artist, Victoria Bjorklund creates a photographic narrative within each of her images. By integrating reflective images with her subject, Bjorklund creates a duality that is aesthetically pleasing and thought provoking. Bjorklund’s images invite the viewer to take a moment to look into windows, savor the tableaux and experience a place where reality ends and your own imagination begins. Victoria Bjorklund is a 2009 recipient of the Tacoma Artist Initiative Program grant (TAIP) by the city of Tacoma, Washington. Click here for an online catalog of Victoria’s work. The work of both these artists will be on view through November 28, 2009, but why wait? Join us for First Thursday (11/5) or at our Artists Reception on First Friday(11/6). We will be open both nights until 8 p.m.
We are looking forward to two inspiring photographers in the Gallery this month—Heidi Kirkpatrick of Portland, Oregon and Victoria Bjorklund of Tacoma, Washington. These two shows are not to be missed! Heidi Kirkpatrick: Gray Area. As a fine art photographer, Kirkpatrick offers interpretations of the world experienced from a woman’s perspective, often using subjects with whom she has a personal relationship. Her willingness to expose her conflicts about how society’s expectations restrain and confine contemporary women allows other women a vehicle to express their conflicts as well. Kirkpatrick pairs photographs with found objects—children’s blocks, books and even old ash trays to create renewed objects of art. By incorporating figurative images and actual portraits, Kirkpatrick “reframes” these stories, allowing for ever changing vignettes. Channeling an old Gray’s Anatomy book, Kirkpatrick encases her paper dissections in or on these objects. Kirkpatrick’s work is included in OSHU’s Corporate Collection as well as several museum collections throughout the United States. Heidi Kirkpatrick is based in Portland, Oregon. She has been featured in two previous group shows here at 23 Sandy Gallery. Preview Heidi’s show here. Victoria Bjorklund: Glass Figments. 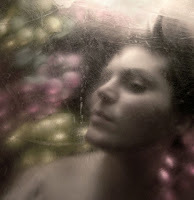 Bjorklund is a photographic and book artist residing in Tacoma, Washington. Her interests lie in both natural and urban landscapes. Influenced by ability of writers to describe the world around them, Bjorklund strives to create a photographic narrative within each image. In her collection, Glass Figments, Bjorklund integrates reflective images with her subject, creating a duality that is aesthetically pleasing and thought provoking, causing the viewer to step past the obvious and explore the more subliminal elements. Bjorklund’s images invite the viewer into the photograph, melding reality with illusion—not unlike taking a walk through the looking glass. Victoria Bjorklund is a 2009 recipient of the Tacoma Artist Initiative Program grant (TAIP) by the city of Tacoma. View an online catalog of Victoria’s work here. Both exhibits are on view through November 27, 2009. Gallery hours are Thurs-Sat, 12-6:00 p.m.